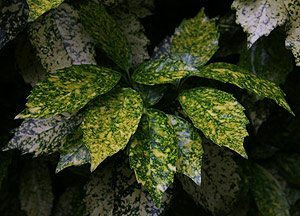 From Japan, Aucuba japonica is a hardy shrub that will grow both indoors and outdoors. An excellent bushy evergreen shrub that adds a strong splash of colour to the rear of the garden border. 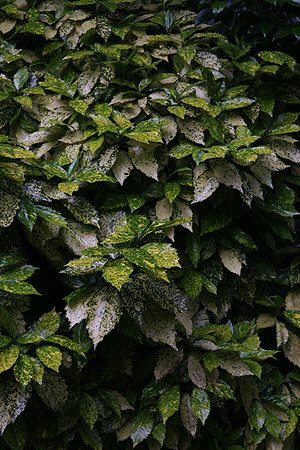 Foliage is a mid green splashed with gold flecks, hence the name ‘Gold Dust Plant’. Aucuba japonica makes an excellent foil between camellias where it adds a lightness to the colour scheme. Older foliage will fade a little over winter to silvery white and green, however the new fliage will be brilliant green and gold. Plant in a a humus rich well drained soil in a part shaded position where its glossy green and gold foliage will add a light touch. Aucuba japonica or ‘Gold Dust Plant’ is a medium sized shrub that will reach around 3m depending on conditions. Plants are easily pruned to maintain a more compact shape. Flowers are small and insignificant but are followed by red berries, however this is a foliage plants used to add colour to the border. Little pruning is required, however prune back in early spring to keep in shape. The ‘Gold Dust Plant’ can be grown in a large pot or container if required. Fertilise with a slow release general purpose fertiliser or a liquid seaweed emulsion fertiliser, keep well mulched to retain moisture. Quality outdoor trees and shrubs in all sizes in large quantities.